The information in this article provides a uniform system for regulating the location, construction, maintenance, removal and relocation of utility facilities on the right of way of roadways located on the state highway system. It also provides for the public safety and the facilitation of construction and maintenance of these roadways. Any location or relocation of utility facilities contrary to this information is declared to be an interference with the construction, maintenance or operation of a state highway and it’s right of way and is prohibited. All work to be performed on the right of way of a state roadway in connection with the location, relocation or maintenance of utilities, and where the roadway, shoulders or right of way will be affected by the work, must only be done under the terms of a permit or agreement to be issued by authority of the MHTC. An application for a permit may be made on established forms specifically stating the nature of the work to be performed. A deposit may be required to ensure completion of the work in accordance with the permit issued. Applications for permits may be obtained at any of the seven (7) district highway offices of the Commission, MoDOT's website, or by requesting it from the office of the Missouri Highways and Transportation Commission in Jefferson City, Missouri. Online permitting is also available to utility companies. Online permitting allows for a quicker turnaround on permit approval, saving the utility companies time and money. Follow this link, Permits to Work on Right of Way, and submit a request to begin online permitting by clicking the “sign up” button. A permit is required for any work on the right of way. Permits for extended lengths or portions of routes may be granted for routine maintenance. Routine maintenance may include tree trimming, series of pole replacements, etc. Emergency operations should be conducted first with a permit application following as soon as practical after the work is completed but within 2 working days. Emergency operations include unplanned work occupying a location up to 15 minutes. Within MoDOT, these operations consist of the initial response to and repair/removal of safety concerns including Response Priority 1 items (refer to MoDOT's Incident Response Plan). When utility lines or facilities are damaged to the point they constitute an emergency situation directly affecting or endangering traffic on the roadway, or public health or safety, as defined by Response Priority 1 in MoDOT's Incident Response Plan, access to the damaged facility by leaving the through roadway at a point necessary to make the emergency repairs can be permitted. This “permit” will be granted provided immediate notice is given to the State Highway Patrol and the Commission's district engineer. A specific application must be made, a permit obtained for the planned work on the roadway right of way, and a Notice of Intent to Perform Work completed (provided to MoDOT a minimum of 2 working days before the work is started). This guidance does not apply to utility lines for service to facilities required for operating the roadway. Major Routes (Interstates, Freeways and Principal Arterials) - These roadways transport large volumes of interstate and intrastate traffic. They are intended to provide a high level of mobility for through traffic. They provide the safest design characteristics and are conducive to high operating speeds. Interstates and principal arterials designated as freeways are designed with fully controlled access right of way. Some principal arterials are constructed with controlled access right of way. Minor Routes - These roadways link cities, towns, and other major traffic generators to the interstate and principal arterial system. As a general rule they are two lane roadways. They are designed to maintain higher overall speeds with little interference to the through movements. A large amount of rural development along these facilities would not normally be expected, so control of access is not normally acquired. Certain roadways in this classification with high traffic volumes may require expressway design criteria. If this is the case, urban criteria is to be used. Utility: Privately, publicly or cooperatively owned line, facility or system for producing, transmitting, or distributing communications, cable television, power, electricity, light, heat, gas, oil, crude products, water, steam, waste, storm water not connected with highway drainage or any other similar commodity, including any fire or police signal system or street lighting system which directly or indirectly serves the public and does not include privately owned facilities devoted exclusively to private use. The term utility also means the utility company inclusive of any wholly owned or controlled subsidiary. The term "utility" includes those facilities used solely by the utility that are a part of its operating plant. The term also includes those utility type facilities that are owned or leased by a government agency for its own use or otherwise dedicated solely to governmental use. Interchange Limits: For the uniform handling of utility installations only, the limits of an interchange are the outside ramp curve points. Vertical Clearance for Overhead Crossings: The vertical clearance of new or existing overhead installations will not be less than the current minimum requirements of the National Electric Safety Code, but in no case less than 18 ft.
30 in. for all other (such as, but not limited to, gravity sewers, force sewers and electric) underground utilities (both parallel and crossing). Scenic Enhancement Areas: Scenic enhancement areas include areas acquired or so designated as scenic strips, overlooks, rest areas, recreation areas and the right of way of adjacent roadways and the right of way of roadways that pass through public parks and historic sites as described under 23 USC 138. Duct: An enclosed tubular casing, or raceway, for protecting wires, lines, or cables that is often flexible or semi-rigid (1-3% diametric deflection). The casing, or raceway, is separate from the cable or conductor that passes through it. 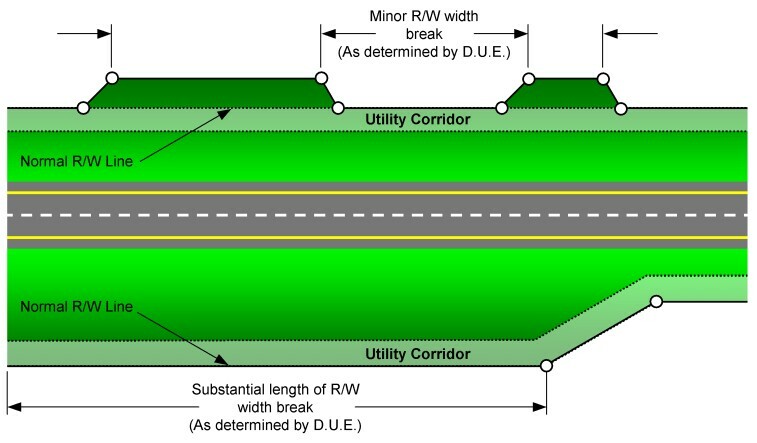 Normal Right of Way Line: An imaginary line that connects sudden breaks in the major right of way points for roadways. Sight distance right of way points (triangles) at roadway intersections are not to be considered as sudden breaks for determining normal right of way. Ditch Line: A line where the roadway ditch meets the back slope. It is located at the lowest point of a V-bottom ditch or furthest point from the roadway of a flat bottom ditch where the roadway slopes back to the existing ground line. Utility Corridor: An area established for the placement of utility facilities parallel and within 6 ft. of the normal right of way. Pull Box Width: The maximum pull box width perpendicular to the right of way line within the utility corridor is 30 in. All utility installations on Interstate roadways or other freeways will be installed, serviced, and maintained without entering or leaving the through-traffic roadways and ramps except at points provided for that purpose. In addition, equipment will not be parked or material stored on the medians, the travelway, the ramps or shoulders of the roadway. New service connections to existing parallel utility facilities will only be permitted where an outer roadway exists, and then only where access is permitted by the MHTC. Roadway Crossings of Utilities Overhead crossings are permitted for power transmission and distribution lines and for multiple circuit communication lines where an underground installation is not economically feasible. Supports for existing overhead crossing facilities may be located on the right of way near the right of way line. Supports for new overhead crossing facilities may be located on the right of way near the right of way line where an outer roadway exists, and will be located off the right of way where no outer roadway exists. Overhead service crossings are only permitted in isolated cases for residential or commercial establishments when the denial of the crossing would require construction of more than 1200 ft. of utility line to provide the service. Main or distribution line crossings are required to serve a general area other than isolated cases. Water service connections and crossings of copper 2-inch inside diameter or less, and meeting applicable material requirements. Existing overhead or underground facilities that parallel an existing roadway that will be incorporated into the completed highway as an outer roadway may remain in place if all maintenance and service can be performed from an outer roadway, and their existing location does not interfere with construction, maintenance or operation of the completed highway. Existing parallel facilities along an existing road that will be incorporated into the completed highway, except as permitted above, will be relocated to the normal right of way line (ie. poles to be within 5 ft. and underground installations 6 ft. of the normal right of way line). Existing telephone conduit systems with multiple ducts may be filled with any type of communication cable until full. Underground facilities are buried within 6 ft. of sight distance right of way lines at roadway intersections unless granted a variance. Overhead facilities may be allowed to span intersecting roadways with sight distance triangles (SDTs) provided the poles, or supports, are located outside the SDT. Careful consideration will be given to the location of guys, anchors, braces, and other supports. Generally, good design procedure will provide that appurtenances be located at right of way jogs, along intersecting road right of way, or at other similar acceptable locations, so that encroachment is held to an absolute minimum. Encasement for existing trunk sanitary sewer crossings may be required for questionable condition, protection during construction, or heavy fills. Manholes will be relocated to the right of way lines or adjacent to an outer roadway. Encasement is not required for new trunk sanitary sewer crossings of vitrified clay, reinforced concrete or cast iron except when installation procedures would produce voids in the roadbed, heavy fills, or installations under pressure. Manholes are to be located off the right of way where possible or adjacent to an outer roadway. No planned or existing facilities will be permitted within the limits of cloverleaf or directional interchanges. Utility installations within the limits of a diamond interchange or a grade separation will be permitted only along the minor road, provided that all construction, service, and maintenance can be performed from the minor road. Manholes and poles will be located beyond the ramp termini. All utility facilities will be installed, serviced and maintained without entering or leaving the roadway except at approved access points, and without parking equipment or storing materials on the median, pavement, ramps, or shoulders. Cutting or damaging the roadway surface or paved shoulders is not permitted. New service connections to parallel facilities and service crossings will be permitted only at access points granted by MHTC. Overhead mainline crossings are permitted provided the supports are located near the right of way line. New overhead service crossings may be permitted in isolated cases for residential or commercial establishments where the denial of such crossings would require the construction of more than 1200 ft. of utility line to provide the same service. Supports for service crossings will be located as near the right of way line as possible. Water service connections and crossings of copper 2-inch inside diameter or less and meeting applicable material requirements. Existing poles that are being relocated, will be within 5 ft. of the normal right of way line. Existing overhead facilities that parallel an existing roadway that will be incorporated into the completed roadway may remain in place if all maintenance and service can be performed without entering or leaving the roadway except at approved access points, and without parking equipment or storing materials on the median, pavement, ramps, or shoulders and their existing location does not interfere with construction, maintenance or operation of the completed highway. Existing underground facilities (other than sanitary sewers) that parallel an existing roadway that will be incorporated into the completed roadway may be left in place where it is impractical to relocate the facility provided maintenance and service be performed without cutting or damaging the pavement or interfering with the construction, maintenance and operation of the highway. Multiple facilities at intersections, existing steel pipe transmission and distribution facilities for gaseous petroleum products that parallel an existing roadway that will be incorporated into the completed roadway may be left in place subject to an agreement by the utility company that maintenance or service and facility expansion will be performed without cutting or damaging the pavement or interfering with the construction, maintenance, operation of the highway and provided that the facility is cathodically protected against corrosion and meets the applicable material requirements. Careful consideration will be given to the location of guys, anchors, braces and other supports. Generally, good design procedure will provide that appurtenances be located at right of way jogs, along intersecting road right of way, or at other similar acceptable locations so that encroachment is held to an absolute minimum. Underground facilities will be buried within 6 ft. of sight distance right of way lines at roadway intersections unless granted a variance. Overhead facilities may be allowed to span intersecting roadways with SDTs provided the poles, or supports, are located outside the SDT. Existing gravity sanitary sewer mains will be considered individually and removed or left in place contingent upon age, condition, the feasibility of moving and whether service and maintenance can be performed without damaging the roadway surface. If an existing parallel gravity main is left in place within the limits of the paved surface, paved shoulder lines or curb lines, stub mains as required will be laid between the sewer main and curb or shoulder lines for future service connections in each block. Manholes will be relocated outside the traveled roadway. Encasement for existing gravity trunk sanitary sewer crossings may be required for questionable condition, protection during construction, heavy fills or installations under pressure. Encasement is not required for new trunk sanitary sewer crossings of vitrified clay, reinforced concrete or cast iron pipe except when installation procedures would produce voids in the roadbed, heavy fills, or installation under pressure. Manholes will be located as near the right of way line as practical. No facilities will be permitted within the limits of cloverleaf or directional interchanges, either planned or existing. Utility installations within the limits of a diamond type interchange or a grade separation will be permitted only along the minor road provided all construction, service and maintenance can be performed from the minor road. Manholes and poles will be relocated beyond the ramp termini. All new facilities will be installed and maintained without cutting or damaging the roadway surface or paved shoulders except in the event underlying rock formations or other obstructions are encountered that prevents boring or pushing operations. Special permission may be granted for pavement cuts when the need is established. Pavement cuts will only be made by permit. Permits will only be issued when it is impractical to otherwise service and maintain the facility. Overhead main line and service crossings are permitted provided the supports are located near the right of way lines. Water service connections and crossings of copper 2-inch inside diameter, maximum, and meeting the applicable material requirements. Existing sanitary sewer mains will be removed or left in place contingent upon age, condition, and the feasibility of moving and whether service and maintenance can be performed without damaging the roadway surfacing. If an existing parallel main is left in place within the limits of the paved surface, paved shoulder, or curb lines, stub mains as required will be laid between the sewer main and curb or shoulder lines for future service connections in each block. Manholes, where necessary, will be relocated outside the traveled roadway wherever practical. Encasement for existing trunk sanitary sewer crossings may be required for questionable condition, protection during construction, heavy fills, or installations under pressure. Encasement is not required for new trunk sanitary sewer crossings of vitrified clay, reinforced concrete or cast iron except when installation procedures would produce voids in the roadbed, heavy fills, or installations under pressure. Manholes are to be located as near the right of way line as practical. Existing overhead crossings that interfere with construction, maintenance or operation will be relocated with their supports as near the right of way line as is practicable. New overhead crossing installations will be located with their supports as near the right of way line as is practicable. Existing parallel surface installations interfering with construction, maintenance or operation will be relocated to within 5 ft. of the normal right of way line. Poles for new parallel surface installations will be located within 2 ft. of the normal right of way line. Existing parallel underground installations interfering with construction, maintenance or operation will be relocated to as near the right of way line as practical. New parallel underground installations will be located within 6 ft. of the normal right of way line. Existing telephone conduit systems with multiple ducts may be filled with any type of communication cable until full. Careful consideration will be given to the location of guys, anchors, braces, and other supports. Generally, good design procedure will provide that appurtenances be located at right of way jogs, along intersecting road right of way, or at other similar acceptable locations, so that encroachment is held to be an absolute minimum. Underground facilities are to be buried within 6 ft. of sight distance right of way lines at roadway intersections unless granted a variance. Overhead facilities may be allowed to span intersecting roadways with SDTs provided the poles, or supports, are located outside the SDT. All existing utility facilities within the limits of a scenic enhancement area requiring adjustment because of construction or reconstruction will be placed underground or relocated beyond the limits of the scenic enhancement area. No new above ground facilities will be permitted. New underground facilities will be permitted provided they do not extensively alter or impair the appearance of the area. Utility companies will be allowed to use any material as a carrier and encasement for their product provided they accept responsibility for any future repairs and/or replacement of MoDOT facilities should a failure occur. Location of the facility, both horizontal and vertical (depth), shall remain at the direction of MHTC. This will allow the utility to use current technology and procedures to provide the best value for their subscribers and the taxpayers of Missouri. Materials specified in the current Missouri Standard Specifications for Highway Construction must meet at a minimum these standards. Cables, wires, small diameter pipes, and other utility appurtenances extending from the surface of the ground will be equipped with covers or guards to improve their visibility. In the event permission is granted to cut an existing concrete or asphalt pavement, all cuts, if possible, will be made with a saw to a minimum depth of 2-1/2 in. The width of cut will be determined by the width of required trench plus 12 in. on each side of the trench. In the event the distance to any adjacent longitudinal or transverse joint or crack is less than 4 ft., the pavement will be removed to the joint or crack. All pavement repairs will be made in accordance with Missouri Standard Specifications of Highway Construction. Special conditions at specific locations, which make adherence to these criteria impractical, may be submitted to the Chief Engineer for consideration of an acceptable alternate. When the facilities are located on private easement within the new right of way to be acquired for a future project, the necessary relocations to permit construction will be effected at the cost of the MHTC. When the utility facilities are on the right of way of a public road or street or on state highway right of way and their relocation is necessary to allow for the construction of a roadway improvement, their relocation must be effected at the expense of the utility. When the facility is partly on and partly outside the right of way of a public highway and the exact cost for each party cannot be determined, the parties will arrive at a percentage reimbursement on an equitable basis. When the facilities are located on private easement, the MHTC will reimburse the city for the necessary cost of relocation to permit construction. When the facilities are located within the city limits and on an existing city street, that is being, or had previously been, taken over by the MHTC as part of its highway right of way, MHTC will reimburse the city for the costs of the initial relocation of such facilities. These facilities will thereafter occupy MHTC's right of way by permit and all subsequent adjustments to the facilities made necessary by improvements to the highway facilities will be at the cost of the city. When the facilities of the city are outside the city limits on public right of way, outside the city limits on state highway right of way or within the city limits on state highway right of way by permit, the relocation costs will be borne by the city. The city limits involved will be as set forth in the agreement between the city and the MHTC for the construction of the project, and subsequent annexation will not affect the rights of the parties or extend MHTC's obligation. When the cost of a portion of the relocation is the obligation, as stated above, of the MHTC and part that of the city and the exact cost of each relocation cannot be determined, the percentage of reimbursement that is equitable will be agreed upon by both entities. When a city must bear part or all of the cost of adjustments to their utility facilities and the cost creates a financial hardship, the MHTC, by its authorized representative, the Chief Engineer, may temporarily assume these costs. A payback agreement with the city will include an applicable interest rate for a comparable maturity from a widely published index of tax-exempt municipal rates, obtained from Financial Services. The pay back time will not exceed five years. When these facilities are located on private right of way that lies within the right of way of the contemplated project, the MHTC will make the necessary relocation or reimburse the political subdivision for their relocation of the facilities. When these facilities are on MHTC right of way, their relocation will be made by the utility at their cost. When these facilities are located on public right of way other than MHTC right of way, the cost of relocation of adjustment will be borne by the owner. In the case of storm sewers, where they are used to dispose of drainage from the highway, the MHTC may assume the cost of the adjustment or relocation. In locations which, by state law, the disposition of sewage and storm waters in one or more municipalities has been delegated to a particular statutory agency, the MHTC will assume the cost of adjustment or relocation of these facilities located within city limits and not now located on MHTC right of way but where jurisdiction over these streets where these facilities are located will be assumed by the MHTC as a part of the project. When a political subdivision must bear part or all the cost of adjustments to their utility facilities, and the cost creates a financial hardship, MHTC, by its authorized representative, the Chief Engineer, may temporarily assume these costs. A payback agreement with the political subdivision will include an applicable interest rate for a comparable maturity from a widely published index of tax-exempt municipal rates, obtained from Financial Services. Payback time will not exceed five years. When utility facilities are located on private right of way and MHTC pays nothing except the actual relocation costs of the utilities involved, MHTC may agree that any future moves of the same utility by MHTC order may be made at MHTC's cost. If MHTC provides a substitute private easement, then MHTC will have no further obligation expressed in the agreement for future relocations. The Department of Natural Resources Clean Water Commission governs the design of water and sewer lines in the vicinity of one another by Regulation 10 CSR 20-8. Basic criteria are outlined below. Details are contained within the regulation. Water Supply Connections Water Supply Interconnections: There will be no physical connections between a public or private potable water supply system and a sewer, or appurtenance that would permit the passage of any sewage or polluted water into the potable supply. No water pipe will pass through or come in contact with any part of a sewer manhole. Relation to Water Works Structures While no general statement can be made to cover all conditions, it is recognized that sewers will meet the requirements of 10 CSR 60-2.010 in respect to minimum distance from public water supply wells or other water supply sources and structures. Horizontal Separation for Water Mains Sewer mains will be laid at least 10 ft horizontally from any existing or proposed water main. The distance will be measured edge to edge. In cases where it is not practical to maintain a 10-ft. separation, installation of the sewer closer to a water main will be allowed provided the water main is in a separate trench or on an undisturbed earth shelf located on one side of the sewer at an elevation that places the bottom of the water main at least 18 in. above the top of the sewer. Water Main Crossings Sewers crossing water mains will be laid to provide a minimum vertical distance of 18 in. between the outside of the water main and the outside of the sewer. This will be the case where the water main is above or below the sewer. The crossing will be arranged so the sewer joints will be equidistant and as far as possible from the water main joints. Where a water main crosses under a sewer, adequate structural support must be provided for the sewer to prevent damage to the water main. When the water main is less than 18 in. above a sewer line, the sewer line can either be constructed with rubber-gasket pipe or encased with a minimum of 6 in. of reinforced concrete. When the size of the water main is larger than the size of cast iron pipe normally used, either reinforced concrete water pipe with rubber gaskets or concrete cylinder pipe with welded joints may be used in lieu of cast iron pipe. Special Conditions When it is impossible to obtain proper horizontal and vertical separation as stipulated, the sewer will be designed and constructed equal to water pipe, and will be pressure-tested to assure it is watertight prior to backfilling. The vertical clearance of new or existing overhead installations will not be less than the current minimum requirements of the National Electric Safety Code. However, in no case will the clearance be less than 18 ft. Private lines are privately owned facilities that convey or transmit communications, cable television, power, electricity, light, heat, gas, oil, crude products, water, steam, waste, storm water not connected with roadway drainage or any other similar commodity, including any fire or police signal system or street lighting system. These lines are exclusively devoted to private use. Private lines can cross MHTC’s right of way in the same manner as other utility facilities. This is discussed in EPG 643.3.4 Location and Relocation of Utility Lines. Private utility facilities, including carrier and encasements, approved materials can be found in EPG 643.3.6 Approved Materials for Underground Utility Facilities Including Carrier and Encasement. Longitudinal use of the highway right of way by private lines is not permitted except in special conditions. Special conditions at a specific location that make adherence to this policy impractical will be submitted to the chief engineer for consideration of an acceptable alternative. In certain situations it may be necessary to obtain approval from the Federal Highway Administration (FHWA) before approval to use the alternative can be given to the private utility owner. All work to be performed on MHTC right of way in connection with the location, relocation or maintenance of private lines, where the roadway, the shoulders or the right of way will be affected, must only be done under a permit or agreement issued by MHTC. An application for a permit will be made on special forms. The application for a permit will specifically state the nature of the work to be performed. The chief engineer will determine and order the location and relocation of private lines within the right of way of any state roadway to prevent interference with the construction, maintenance and public use of state roadways. A deposit or bond will be required to insure completion in accordance with the issued permit. Applications for permits may be obtained at any of MHTC’s seven (7) district offices or the Central Office in Jefferson City, Missouri. Replacement of individual poles and attachments or other existing private line facilities where only spot excavation is required, and the excavation is not between the shoulder lines of the roadway, may be considered as maintenance. In this case, a permit will not be required, provided the private line owner abides by all parking and access regulations earlier discussed in this article. Where parking and access violations occur or if the right of way is left in an unsatisfactory condition, the private line owner may be required to secure a permit for future maintenance work on the right of way. In any case, a specific application should be made and a permit obtained for any contemplated work. Design personnel are assigned a chief role in issuing permits to allow utility facilities on highway right of way. However, it is the responsibility of all MoDOT staff that work with utility owners to improve relations with them as a core function of their effort. District utilities engineers and the Central Office Design Liaison Engineers are the focal point of contacts with utility companies on all utility matters. The general procedure for the issuance of utility permits together with a listing of the responsibilities of certain district and Central Office staff is available. This information provides the general procedures to uniformly process utility permit requests and agreements for utility attachments to bridges. A bridge attachment is any utility, including water lines, sewer lines ,communication lines, electrical, or any other facility of a similar nature that is fastened to a bridge for the purpose of spanning an obstacle. No utility facilities will be permitted in or on a structure carrying interstate or freeway traffic unless it is part of a federal requirement or for MoDOT’s use. Where grade separations do not carry interstate traffic, wires (communication, electrical, fiber or metal) will be allowed only where no other practical means exists for the crossing. At stream crossings not carrying interstate traffic, water lines, sewer lines and wires (communication, electrical, fiber or metal) will be allowed. Gas or petroleum utilities are prohibited on all structures due to security/risk reasons. No utility facilities will be placed on any structure except by agreement. A charge will be made for the increased maintenance cost involved. When permitted, a 50-year occupational agreement is executed with the utility company or local entity for the attachment. The occupational agreement includes a fee, established by the Bridge Division, charged for the 50-year time period. Requests to attach facilities to existing structures being maintained by MoDOT will be submitted to the Bridge Division by the district with their recommendations. If the applicant submits a request to a division office, it will be sent to the district for review before it is submitted to the Bridge Division for approval. It is expected that the District Utility Engineer (DUE) has worked with all the relevant district personnel including the regional District Bridge Engineer before submittal. For attachments to existing structures, the design drawings must be signed and sealed by a registered professional engineer licensed by the State of Missouri. The Bridge Division will review the request for acceptability of the design and location. The Bridge Division may contact Bridge Maintenance when questions about a condition of a structure or other special circumstances exist. If acceptable, the district will be told to inform the applicant of the amount of the 50-year fee, and any revisions required in the design or location of the attachment. If unacceptable, the district will be told of the reasons for the disapproval. If the applicant agrees to the attachment fee and the required modifications, an agreement will be prepared by the Bridge Division for execution by the applicant and Commission. The district will issue the permit for the attachment after the agreement has been fully executed by all parties and the attachment fee has been submitted to the Audits and Investigation Division with a copy sent to Bridge Division. Checks should be made payable to Director of Revenue, Credit State Road Fund. Requests by utility companies or local entities to attach a facility to a bridge being designed for a proposed MoDOT project must be submitted to the Bridge Division by the district. The DUE will draft the agreement and Bridge Division will review the agreement and determine the costs involved. Once the draft agreement is approved and costs have been determined and agreed to, the agreement will be sent to the utility by the DUE for signature. Once the agreement has been returned by the utility to the DUE, the DUE will send it to Bridge Division for approval. Bridge Division will then send to CCO for review and Commission signatures. Bridge Division will retain the original copy, and copies will be sent to the DUE and utility for their files. Payment from the utility for the attachment will be sent to Financial Services by the DUE. The DUE should discuss with Financial Services how to get the payment credited to the project constructing the attachment. For public utility requests from government entities such as cities, counties and other municipalities, the requested information shall be submitted to Bridge Division as described above. However, the district will take the lead in preparing the municipality agreement with input from Bridge Division and Bridge Maintenance. A conscious effort will be made to determine where the structure is located and what effect the utility attachment will have on the structure as viewed by the public. For example, is the structure over a scenic stream that is extensively used by canoeists, or does the structure span a road that may provide access to a park, campgrounds, or boat launching facilities? Is the structure a grade separation where the motoring public will see the attachment before they pass under it? The type of utility facility must be carefully considered before approving its attachment to a structure. Gas or petroleum product pipelines have the potential to be very dangerous and are not permitted for security reasons. Electric lines will be located to cause minimum exposure to MoDOT maintenance personnel and the public. Do not allow welding of attachment hardware to structural steel members (i.e. flanges, webs, stiffeners and diaphragms) whether in tension or compression. Do not allow drilling holes in any structural steel member. Do not allow drilling holes for anchors into any prestressed concrete member. Although allowed, drilling holes for anchors into the underside of bridge decks must be done with caution. It is recommended all anchors be installed to miss deck-reinforcing steel. Generally, drilling into decks will not be allowed where sonotubes were used (voided slab bridges). Be sure the depth of the holes will not cause breaking out of concrete on the topside of the concrete deck. Placement of utilities must not prevent the removal of old paint, the application of new paint on superstructure steel, or cause debris buildup, which could cause structural deterioration. Attachment hardware will be new, properly coated to prevent corrosion, or non-corrosive material designed to support the utility facility. In general attachments are made on the underneath side of the bridge deck. 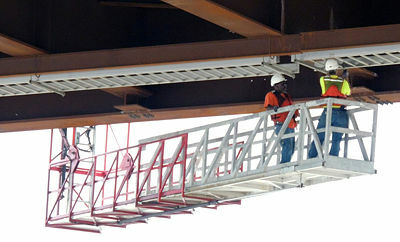 The condition of the bridge deck will dictate the location of the attachment supports. An exception may be attachments to trusses or other overhead structures. Large diameter pipes require more substantial support than concrete anchors can provide. Attachments that may require manholes in bridge decks are not allowed. When attachments are required to structures over streams that may carry large drifts, they must be attached to the downstream side of the structure and above the lowest superstructure element. A better appearance can be achieved by having the attachment made to the inside of the exterior girder rather than to the more visible outside. It may be desirable to locate the attachment between the girders and above the bottom of the lower flange to hide the conduit and the attaching hardware. If aesthetics is not a concern, it is preferred to locate the attachment on the outside of the exterior girder. 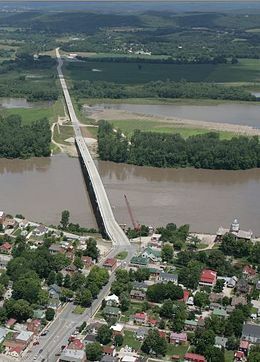 Due to structure replacement or rehabilitation, the current status of the structure must be known when reviewing a request for a bridge attachment. The district should determine whether the structure has been programmed for replacement or rehabilitation and provide this information to the utility company or local entity. In almost all cases, the utility or local entity is responsible for the cost of removing or relocating their facilities if it is necessary for any repair, widening, improvement, or reconstruction of the structure. If the attachment cannot be built while one-lane traffic is maintained on the structure, it will not be allowed. Construction procedures that severely restrict traffic may factor into the allowable location of the attachment on the structure. When scaffolding is to be attached or supported by bridge rails, bridge superstructure or substructure, the procedures for construction of the attachment must be reviewed. The utility company or local entity will pay for, or be responsible for, the painting of the attachment, if necessary, when the bridge requires painting. Unique situations will be discussed with the Bridge Division as required. Any excavation on MoDOT right of way requires that Missouri One Call be contacted to locate any utility facilities in the work area. Locations marked through the Missouri One Call system are approximate, however, and non-invasive digging methods (hand/soft digging, pot holing, vacuum methods, pressurized air/water, pneumatic hand tools, etc.) are required when the excavation falls within 2 ft. of the markings. Because such non-invasive digging represents additional costs to MoDOT, utilities that own, operate, and maintain facilities on MoDOT right of way are responsible for performing or paying for the non-invasive digging. Utility permit applications present the utilities with three options by which to confirm the exact location of facilities on right of way: (1) perform non-invasive digging to confirm the horizontal and vertical location of their facilities; (2) pay MoDOT an up-front lump-sum for the estimated costs of performing non-invasive digging, under the terms of a separate agreement, to confirm the horizontal and vertical location of their facilities; or (3) relocate the facilities, at their own cost and expense, to an area of right of way outside of the excavation limits, as designated by MoDOT. Should non-invasive digging methods reveal that the location of the utility’s facilities interfere with the Commission's proposed project excavation, relocation of those facilities by the utility will be required in conformance with the utility permit for new and/or replacement installations. Utilities that have, at no cost to MoDOT, relinquished private easements and relocated their facilities into MoDOT right of way by permit, have been assured that they will not be responsible for the costs of relocating those same facilities in the future. In these cases, MoDOT will not require utility companies (and cities) to be responsible for performing or paying for non-invasive digging. MoDOT will simply absorb the additional costs (labor) of such digging work. Discussions with the utility company are required to determine the preferred method of exactly locating existing facilities. Once negotiations are complete, and a utility company elects to pay MoDOT to perform the non-invasive digging work, agreement UT07 shall be executed between MHTC and that company. This page was last modified on 14 January 2019, at 15:57.